Asian stocks were mixed on Monday as traders watched for developments on a fresh round of trade talks with the United States this week in Beijing. Markets in China and Taiwan, reopening after a weeklong Lunar New Year break, edged higher on hopes that American and Chinese officials will make progress on a wide-ranging dispute that has weighed on the global economy. KEEPING SCORE: The Shanghai Composite index picked up 0.4 percent to 2,628.50. 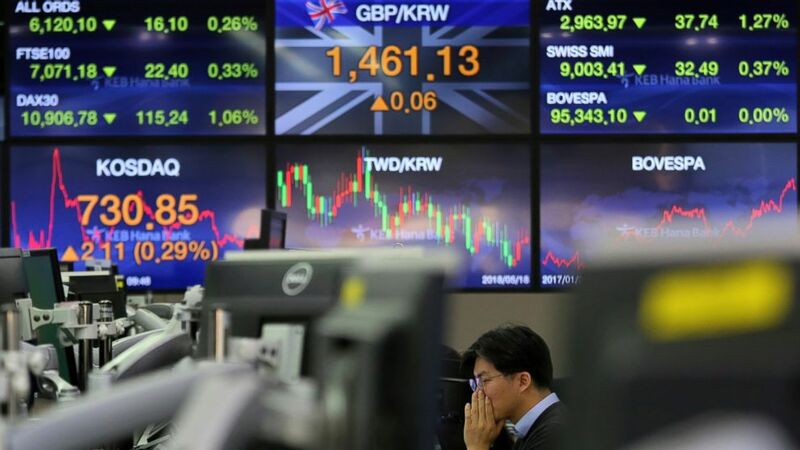 The Kospi in South Korea declined 0.1 percent to 2,175.04 while Hong Kong's Hang Seng rose 0.2 percent to 27,991.49. Australia's S&P ASX 200 was down 0.5 percent at 6,040.00. Stocks rose in Taiwan but fell in Singapore and Indonesia. Japanese markets were closed for a holiday. WALL STREET: Gains by technology and consumer goods companies led most U.S. indexes higher on Friday. They more than balanced out losses by financial stocks and retailers after a mixed bag of quarterly earnings. The broad S&P 500 index climbed 0.1 percent to 2,707.88 and the Nasdaq composite rose 0.1 percent to 7,298.20. The Dow Jones Industrial Average lost 0.3 percent to 25,106.33. The Russell 2000 index of smaller company stocks advanced 0.1 percent to 1,506.39. U.S-CHINA TALKS: Officials from the U.S. and China will gather in Beijing for trade talks on Thursday and Friday. U.S. Treasury Secretary Stephen Mnuchin and trade representative Robert Lighthizer will lead the American delegation at the talks, which are aimed at bringing both sides closer to resolving deep-seated issues such as unhappiness over Beijing's technology policy. Lower-level negotiations are set to begin Monday, but a resolution isn't expected before a truce on tariffs expires in early March. Any agreement before then, or a simple extension of the truce, will be viewed as a positive for markets. If not, the U.S. is expected to raise import taxes from 10 percent to 25 percent on $200 billion in Chinese goods. ANALYST'S TAKE: "For markets, after the worst December and best January in years, it appears that we are back at inflection point across various asset classes, waiting for direction yet again," Jingyi Pan of IG said in a market commentary. ENERGY: U.S. crude lost 56 cents to $52.16 per barrel in electronic trading on the New York Mercantile Exchange. It gained 8 cents to settle at $52.72 per barrel in New York. Brent crude, used to price international oils, shed 46 cents to $61.64 per barrel. It added 47 cents to close at $62.10 per barrel in London. CURRENCIES: The dollar rose to 109.89 yen from 109.73 yen late Friday. The euro was flat at $1.1324.